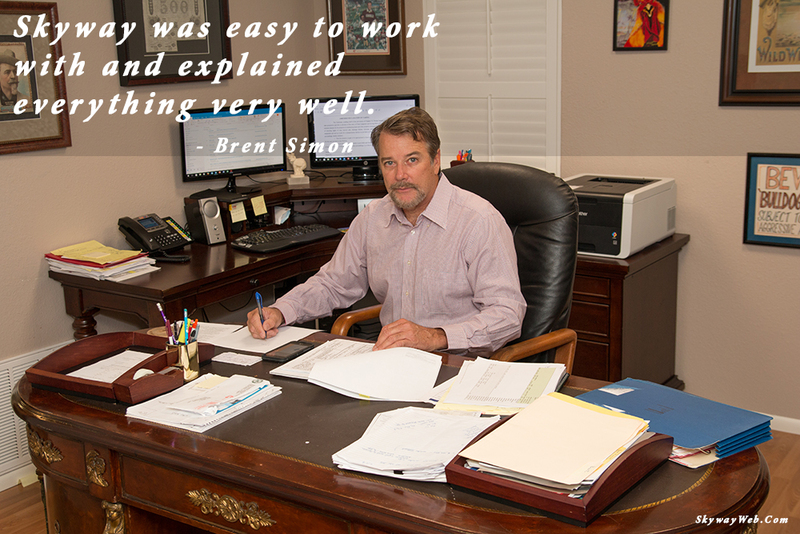 I had the distinct privilege of being introduced to The Brent Simon Law Group when they were in search of finding someone to help them improve their online presence. Although they had a website, it wasn’t very user friendly and didn’t visually represent the quality of their law practice. They had some great ideas of what they wanted in their new website and wanted a custom website from someone local who they could meet with in person. A: The old website was not spaced correctly. The content was not easy to follow visually. The layout was outdated. Q: What was the process like working with Skyway Web Design? A: Skyway was easy to work with and explained everything very well. If I had any questions Skyway would reply very fast and let us know when our questions could be answered. Specific directions were provided and very informative. They were very understanding when we took our time developing content for our website. Q: What are some of the benefits you see the new website providing to your company? A: Ease of access, presentation, professionalism. Please visit their website at https://fullcomp.com. If you have any eminent domain needs in the state of Florida, please give Brent and his team a call! Please post any comments or questions below. If you would like to improve your online presence, please contact me here.